Tents are one of the more expensive pieces of gear you’ll purchase if you’re getting into camping. Tents also have a bewildering variety of options to choose from if you’re starting from square one and trying to sort it out. They’re part of the BIG 3 (Tent, Backpack, Sleeping Bag) items that contribute the most gear cost and weight. Overall TL;DR: If you’re only trying camping on for size, a $20 big box (WalMart, Big5, Academy) tent will get you through a weekend, but won’t hold up to much real use if you decide you like camping. For 2 or 3 people, get an ALPS Chaos 3 (5.6 lbs total, sleeps 3, full fly, 3 season). I got it for $106 on clearance at REI and it’s $125-$150 usually online, depending on the season. 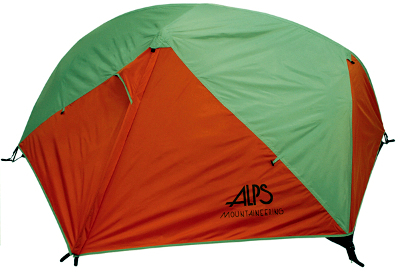 For 1 person get the ALPS Zephyr 1 if you want a free-standing tent. Whatever tent you get, don’t buy the separate Floor Saver or Footprint- get a non-crinkly mylar sheet, (an Adventure Medical Kits SOL 2-person blanket), for $8 on Amazon or $7 on ebay instead- it’s warmer and lighter than the standard tent footprint. Cut the mylar sheet to size so it doesn’t stick out from beneath the tent and catch rainwater, and use it shiny side up. I think of modern fully enclosed tents in three broad price/weight categories now, although there are some exotic exceptions. With many tents, within these three pricing categories there are also two independent sturdiness or “number of seasons” options (3-season or 4-season), which I’ll also talk about. I’m completely skipping giant canvas expedition tents, silnylon teepee / portable stove setups for extremely cold weather, ultralight tarp-only setups, hammocks, and bivys, just to let you know what you’re missing. These omitted types are a lot less likely to be what you’re looking for if you’re just getting into camping. First price category is fiberglass-poled big lots store tents. (section tl;dr: don’t get one of these it will break). You can get one of these for 20 bucks at a Big 5, Wal-Mart, Fred Meyer, etc. These are far less expensive because the fiberglass poles are much cheaper, although they are also heavier and easier to break than the anodized heat-treated aluminum poles you get at the next level. If this were the only real difference, they could be a good bargain for a lot of casual users. Unfortunately, tents in this group are always pieces of crap, as I learned the hard way while trying to go this route. They universally use terrible zippers that can’t knock more than a buck off of the manufacturing cost, but will always break within a weekend’s worth of use. Also, rather than steal fabric patterns from nicer, extremely well-designed tents, the bargain class tents always use clunky designs that allow the poles and tent stakes to put huge strains on all of the zippers and fabric seams at all times, further shortening the already tiny chance that one of these tents will make it through a weekend. I’m sure there must be some sturdy exceptions in this category, but I haven’t found any personally, so I decided it isn’t worth trying to navigate this minefield of crap. These might be good for letting kids camp out in the backyard, or for testing out whether you like camping, but they won’t hold up to much use and are liable to fail on you just when you really need to stay dry. The second, and largest, category (section tl;dr: get this kind, with a complete all-over rainfly) is polyester and mesh tents with anodized heat-treated aluminum poles held together with elastic cord. These are inherently lighter and more durable, and also have much better patterns and designs, (which, as mentioned, are inexplicably never copied by the fiberglass pole discount models). They range about 100-200 bucks unless you’re getting fleeced, which is quite possible in this category, so heads up. Within this group, there are two different common ways they knock some weight off of backpacking tents. One is to make the main tent out of more mesh and less solid fabric, and still have the rainfly cover the entire tent head to toe. The other is to keep the mesh down to a couple of windows and only give you a rainfly that does not cover the entire tent (many otherwise good Eureka tents fall into this incomplete-rainfly group). The possible downside of the “lots of mesh” style is it might be less durable in the long term. The possible downside of the other “incomplete rainfly” style is that any solid part of the tent which isn’t completely covered by a second rainfly layer will leak every single time you rub touch it. Because modern patterns put very little strain on the mesh panels from the frame and zippers, I strongly favor the “lots of mesh” style of mid-priced lightweight tent, for normal recreational camping use. I’ve had a mesh-heavy style for 4 years, with 2 large clumsy humans and a 70 pound dog and it’s none the worse for wear so far. The last group (section tl;dr: fine but not worth the $$$$) is often made of silnylon fabric, or most recently Cuben fiber, a high tech laminate that started life as material for America’s Cup sails. These are lighter fabrics, paired with the same aluminum poles as the second group, or sometimes with carbon fiber poles. These are all generally outstanding tents. However, even if you intend to do 15-plus mile hikes at altitude every day, the small weight savings that they offer is never ever worth the large additional cost. As long as you have the money, and are willing to admit to yourself that you’re just trying to impress your camping buddies with a logo, or have started to get a little carried away about your gear, knock yourself out- these are excellent, well designed, unbelievably light tents. I would use one of these if someone gave me one for free, for example. If you’re hoping to find one of these without spending an arm and a leg, maybe check your local REI Garage for a returned one with no rips (REI has a lifetime return policy, and re-sells the returned items at a steep discount). If you really want under-a-pound level lightweight coverage, many people eventually decide to give up a freestanding enclosed bugproof tent, and get a tarp with the sides open and stakes and lines holding it taut, or go with a hammock. For myself, I like knowing my dog can’t slip away in the night so I stick to an enclosed design. On to the “number of seasons”. For mainstream tents, within a particular price category, for each “number of people” size (2-man, 3-man, etc.) you’ll often see two different models of tent from the same manufacturer. These will usually be called “three-season”, and “four-season”. Four-season tents cost a little more and are heavier. This is because they’re to not collapse on you under some snow as easily as a three-season tent would. If you need to sleep in a tent while a foot or two of snow gets laid down, definitely go four-season. In fact, read the fine print in some end-user reviews to be sure your four-season tent is really four-season. If you’re not planning to camp during heavy snowfall, three-season is definitely the way to go: lighter, cheaper, with more mesh for stargazing on nice nights and for ventilation in the summer. I have a three-season tent. Recommendations: ALPS Mountaineering completely runs away with the price/performance game on tents, if you shop the sales online, or hit up Amazon or Google shopping. Kelty is a distant second if I had to pick one, and about once a year REI will have a blowout price on one of their nice tents, which are otherwise about twice the price. A few other companies are all over the place on price depending on the particular model. Finally, some great manufacturers with very similar tents to these, such as Big Agnes, will never show competitive pricing with ALPS, or even with Kelty or REI (on tents), so don’t bother waiting for it to happen. My tent: Alps Mountaineering Chaos 3. 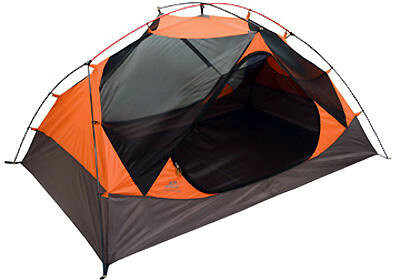 This is a three-season tent from the second, midrange, category. I got it for $106 on sale (REI outlet with in-store delivery) and have often seen it online for under $125, although the price goes up and down over time. The Chaos 3 comes with the rainfly and a gear hammock to stow some items in the top of the tent, but not the footprint. Although I found the footprint (“Floor Saver”) for it this tent for $11 also on sale at REI Outlet, I actually recommend using a non-crinkly reflective mylar sheet cut to size ($8 on Amazon or $7 on ebay) as a footprint for this or any tent- it’s lighter and warmer! I use this tent for two large adults (6’2″ and 5’11”) and one 70 lb dog, and it’s got plenty of room for us all. Everything about the design, from frame to door placement to mesh placement, is very much best-in-class. On that point, it’s worth noting that the frame design for most tents of this type- whether the Chaos 3, the REI Half-dome 3 or 2+, or the overpriced but lovely Big Agnes Seedhouse 3- is actually usually done by the same couple of engineers, who work for the company that makes the patented style of aluminum tent poles that all of these tents share in common. Very comparable items would include the also great, incredibly similarly designed REI Half-Dome 2 Plus, which is typically around twice the price of the ALPS although it goes on blowout sale about once a year. The Half-Dome 2 plus shows up used on Craigslist reasonably often, although not always for a reasonable price. The four-season cousin to the Chaos 3 is the ALPS Extreme 3, which is also an awesome tent at an unbeatable price, if you need a four-season tent. I camp with someone who has the Extreme 3 and they love it. Its smaller cousin is the ALPS Chaos 2, whose small weight savings and zero cost savings are not a great advantage over the Chaos 3, for most users. For a solo tent , I would suggest the free-standing ALPS Zephyr 1 over the non free-standing ALPS Mystique series, although at that point a bivy or a hammock might be a better option, depending on your needs (not for me, since I have a dog).